Our member Luis booked an appearance at Windchime Assisted Living in Kingsland, TX. 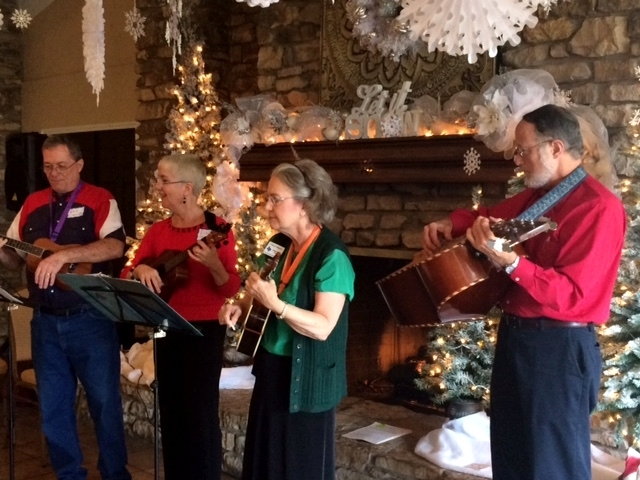 We had a great time singing Christmas carols and other traditional songs for the folks and they sang along with us. We had a great time! 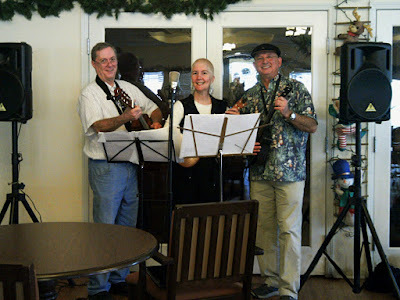 We played to an appreciative and enthusiastic crowd on December 23rd during the break in Play It Again's regular monthly gig. Check out these beautiful harmonies by the crowd, it was a lovely evening! Afterwards we went to breakfast/lunch at Tea Thyme Cafe across the street. Great hangin' together, isn't it? We made an appearance at the Highland Lakes Democratic Women's Club Christmas Luncheon at the Hidden Falls Country Club in Marble Falls. Don provided a simple amplification setup, as the dining room was large but the acoustics were fairly decent. They had an interesting program and officer's swearing-in, thanked the officers and members for the past year's service, then a very satisfactory lunch. At the end we performed 8 Christmas songs. From the Club we had four attendees, Lisa, Don, Cheryl and Mike. 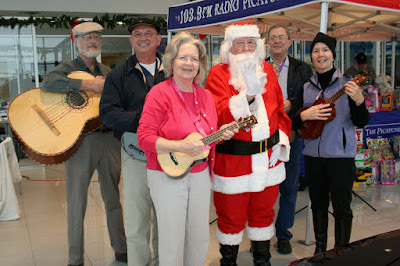 Several volunteers stood behind us to fill in with voices and the harmonies were quite gratifying. The crowd really seemed to enjoy the music, and we had a GREAT time.